Are Patient Principal Diagnosis Ratios Impacting Your Hospice's Bottom Line? No two hospice patients are the same. And yet, part of the challenge that hospice leaders face is knowing how to plan effectively for the year ahead when so much depends on those patients and the time they spend in hospice care. Over time, a hospice program can identify probabilities and trends that can help with advance planning and resource distribution, from inventory management to staffing and budget allocation. One data trend that should be closely monitored is the number of patients by admitting diagnosis. Knowing what the typical diagnosis mix is for a hospice program, and what that mix is likely to be throughout the year, can offer valuable insights for planning potential costs. Considering how impactful expected length of stay can be, as well as the cost of medication, on a hospice's bottom line, conducting an analysis to determine any trends is well worth the effort. How Balanced Is Your Hospice? The National Hospice and Palliative Care Organization’s most recently published figures on the characteristics of Medicare beneficiaries who received hospice care in 2015 revealed nationwide averages. Included in these is the breakdown of the most common principal diagnoses for hospice patients. Over the years, the percentage of patients with a principal diagnosis of cancer has decreased as awareness of hospice grows among individuals with other chronic conditions. Hospices have adapted to accommodate and care for patients with an increasing range of diagnoses, and by no means is having a diagnosis mix that looks like the nationwide averages essential to the success of a hospice program, but knowing what to expect in order to better manage your diagnosis mix is. When an imbalance in patient diagnosis ratios creates a problem for hospice management, it often is due to the disparities in typical length of stay and medication costs for different principal diagnoses. The NHPCO report also reveals data on the length of stay for the most common principal diagnoses. On average, patients with a principal diagnosis of dementia received the most days of care. In fact, the median length of stay for dementia patients was 56 days—significantly longer than the next longest median length of stay, which was 28 days. Experiencing an imbalance on either side of the averages for time a patient spends in care can create challenges for effective hospice management. The hospice market has only become more competitive in recent years. Operating within tight margins means that there is an advantage for programs that can optimize their resource management. Having a good grasp of your hospice's typical diagnosis mix allows you to make estimates (such as with the expected length of stay), but also to tap into known trends and statistics about treating those disease-types. When you consider the cost of cancer medications, for example, being able to identify details such as where cancer patients influence operating margins the most contributes to being able to plan for those costs and improve business forecasting. In general, if a hospice were admitting a disproportionate number of any one principal diagnosis, then being able to properly allocate resources to accommodate these individuals is crucial to providing a good patient experience. If your hospice is seeking a more balanced representation of admitting diagnoses, a targeted campaign to reach potential referrals for that group may be in order. Building a network of hospice referrals is essential for any successful hospice program, but instead of competing for any physician referral, taking a more strategic approach can help to provide balance and allow for better future planning. 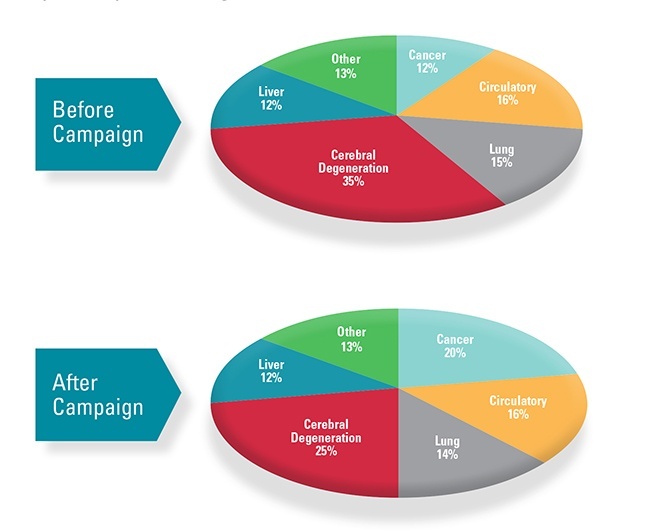 For example, a hospice with a high percentage of longer length-of-stay patients that can identify an opportunity for admitting a higher ratio of patients with a principal diagnosis of cancer can create a campaign directed at oncology offices or groups specifically to boost referrals among cancer patients. Seeking to balance your ratio of principal diagnoses could also present an opportunity to grow or expand your hospice program in a new direction by focusing on a disease-type that may be currently underserved. Helping to build awareness of the benefits of hospice for that group could mean achieving a more diverse diagnosis ratio in the short-term, but also building the foundation for long-term growth. Before launching a targeted campaign of your own, consider first what will happen if your hospice program is successful in acquiring more referrals in a new group. The best referral networks are just that—networks. Having a patient referred to your program from a physician once is good, but ideally they will see the great experience that you provided and continue to refer patients. Vendors that you partner with are an important part of the service you provide. Additionally, they may serve as a helpful resource for expanding into new markets, and in succeeding in those markets once you earn new referrals. When Care Partners expanded their referral network, they also needed to expand their clinical knowledge of certain medications. Accessing expertise to serve the specific segment was as simple as turning to their pharmacy partner. “Our staff needed to be educated by our pharmacy provider on proper medication usage from out specific oncology referral group,” says Andy Kyler, Chief Executive Officer of Care Partners. Conducting a thorough analysis of the past several years of admitted patients will yield invaluable information to help your hospice identify imbalances and uncover opportunities to increase efficiencies and to promote growth. Information is empowering. When you have the data you need to determine those opportunities, don't hesitate to make a plan of action, and to leverage your vendor relationships when possible. To start targeting or increasing referrals to your hospice, get the free OnePoint Patient Care ebook: How to Leverage Your Pharmacy Provider to Build a Strong Referral Network.